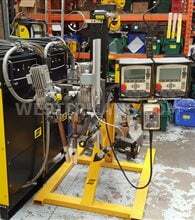 Westermans stock a broad range of Used and Refurbished Column and Boom welding equipment, which can be supplied with various welding applications such as SubArc and MIG/MAG machines. 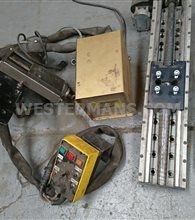 We sell new and refurbished postioning equipment from many leading manufacturers such as Lincoln, ESAB and Bode, with warranty included as standard. 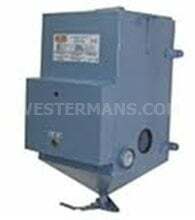 We buy and sell all the other ancillary equipment assocated with welding manipulators such as welding rotators and submerged arc welding systems. 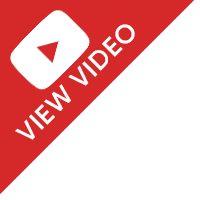 Browse the selection below. 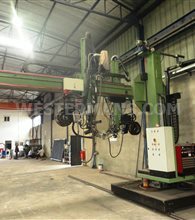 A column and boom welder is a machine that is made up of a "column" of metal going vertically and a "boom", which is a piece of metal that runs along the column horizontality. 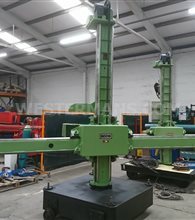 The boom can move up and down the column, and has a form of welding equipment at one end and a counter weight at the other. 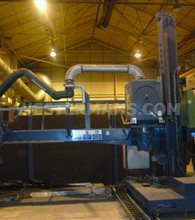 Column and Boom manipulator allows for easy access to different parts of the metal work piece. For large work, a column and boom allows for the welder to reach the top and move across the metal without hassle. 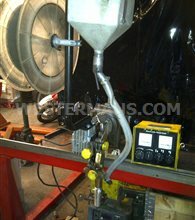 Why do we need column and boom welders? Normally, reaching the top of large work pieces can be difficult and hazardous work. 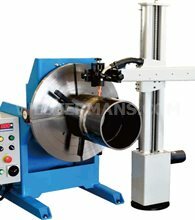 If that work piece is a large pipe, the welding work is made harder because of the curvature of the pipe or vessel. A column and boom welder removes that difficulty. 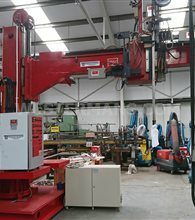 Able to move vertically and horizontality across the metal, the column and boom welder enables much more to be carried out in high demand processes. 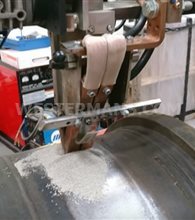 Column and booms when used with pipe rotators/turning rolls for a continuous weld in production of steel tubular, such as tanks and vessels, using the circumferential saw (submerged arc)method, used in pipeline processing plants etc. 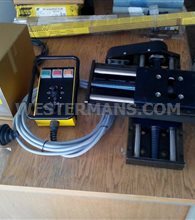 Welding manipulators is often a confusing term when referring to welding positioning equipment. 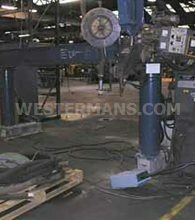 In North America a welding manipulator is a column with a boom arm often used to hold sub arc welding heads and flux over a rotating tank or vessel. 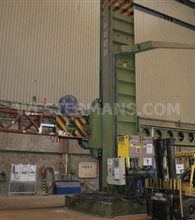 The boom is most often variable speed in the reach and the column provides constant speed lift of the cantilevered boom arm to the height needed for welding the part. 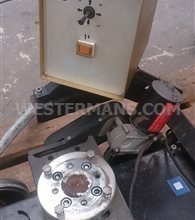 Another name for these specialised machines is a weld head locator. 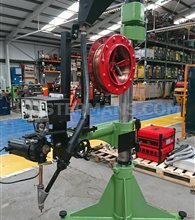 The boom and column weld manipulators are used in conjunction with other pieces of positional equipment; positioners and rotators are the main ones. 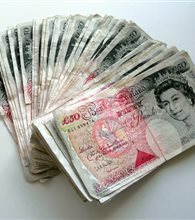 First thing is how much weight will you need to support on the column and boom? The other this is how much height or lift will you need to position the weld head over the part you plan on welding. 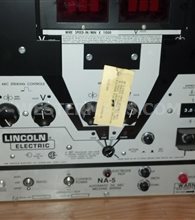 Now you need to factor in how much reach you will need to get the welding equipment over the location on the part such as a vessel. A 10' vessel rotating beneath the column and boom will need to be at least 12' in height to be sure you have enough room for the weld head and welding torch. Often times other equipment is needed on the boom, such as a seam tracker and sub arc flux recovery hopper. All of the weight has to be factored to ensure you have a rigid arm holding the equipment so it does not move or bounce while welding. Column and Boom manipulators come in all sizes from as small as a 2'X2' all the way up to 30'X30' and even larger. Some of the column and booms are powered reach, some and manual hand crank reach. 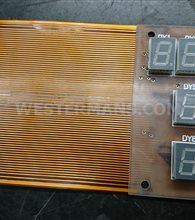 Most units are power elevation but a few are counter balanced hand crank design. 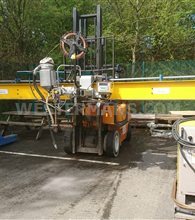 These are most often the smaller size units where just a torch or welding feeder is mounted on the end of the boom gantry arm. The weight mounted on the end of the boom arm can be as little as 100 lbs and up to over 2000 lbs with the boom arm fully extended. 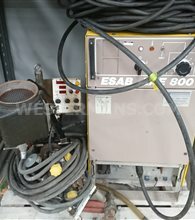 Good quality welding positioning equipment brands are Bode, ESAB, Jetline, Koike Aronson, Ransome, Preston-Eastin and Pandjiris. 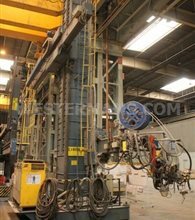 We can outfit any size manipulator with a complete submerged arc welding package or automated tig welding system. 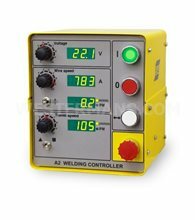 If you need information on how to use this piece of welding positioning equipment call for more information. 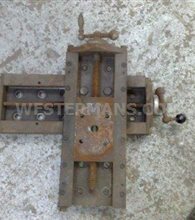 We have friendly highly qualified technicians to help advise you on the proper size manipulator for your welding application. 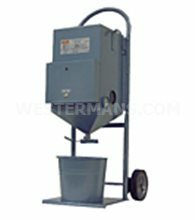 Let us choosing the proper equipment for your industrial fabrication needs. 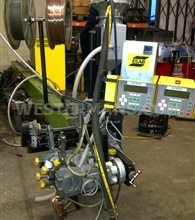 A Welding Manipulator can also be know as a Pedestal welder. Process Towers, Chemicals Reactors, Silos, Storage Tanks, Heat Exchangers, Pressure Vessels, Boilers, Pipelines , Ovens, Structural Steel, Columns Process and Biodiesel Plants are further areas of manufacture that would suit Column and Boom welding equipment.